October is Epidermolysis Bullosa Awareness month! In honor of that, I interviewed Barb, whose 8 year old son, AJ, was born with the disease. How does it affect your child? How does it affect daily life? It's a genetic condition that impacts the production of collagen. It causes his skin and internal membranes to be very fragile. He develops blisters and wounds very easily. Each day he soaks in a tub, and his bandages are removed. 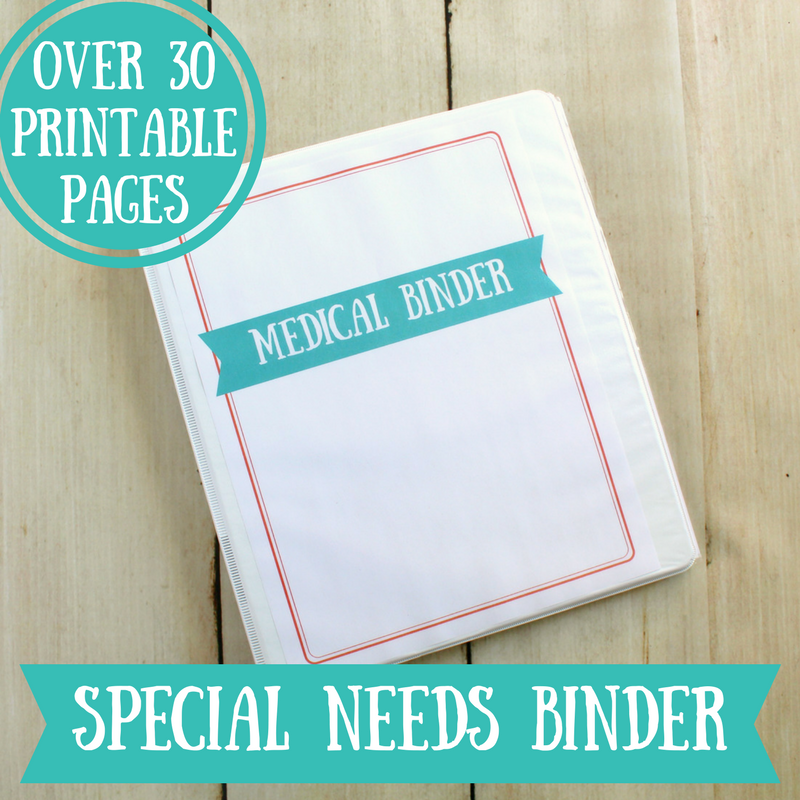 We lance the blisters, treat the open wounds and wrap with specialty bandages. A lot of time is spent treating his wounds. He is unable to eat much due to GI issues related to EB and is fed through a GJ tube. He vomits multiple times a day and this past year has been very hard on his eyes as well. He often has blisters in them. He is in a lot of pain and uses a power wheelchair to reduce damage to his body. When did you find out about it? Tell me about that experience. We were told that a little boy was born with a life threatening skin condition and that his birth mother was unable to care for him. He was three weeks old and waiting in a NICU for a family. I had seen a documentary on the disorder and we knew we were the family for him. At six weeks of age we brought him home from the hospital. 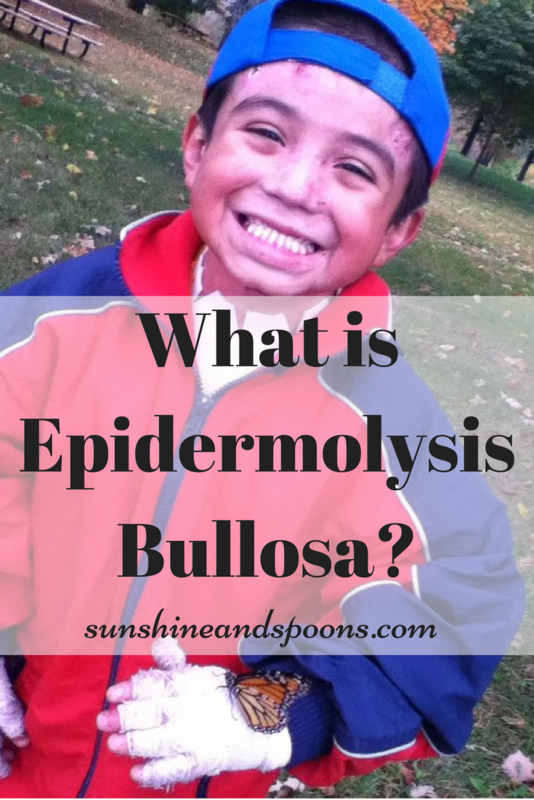 What happened after your child received their diagnosis? How did you react? We were aware of the diagnosis before we met him so there was no surprise. Sometimes it seems odd that were it not for EB he would not be my son. I think it's a very different experience to adopt a child with a disability versus having a birth child diagnosed with a disability. My first biological child died from a genetic disorder so I can empathize with those families that have a child born with a life threatening disorder. See the award winning video that AJ's brother, Andrew, made about AJ here. How does your child feel about their diagnosis? He accepts it but knows it is hard. It helps a lot that we have adopted other children with disabilities. Their challenges may be different but the experiences are often similar. He hates to be stared at and has dealt with many rude and unkind comments from children and adults. We do a lot of educating of the public and not by choice; rather out of necessity. 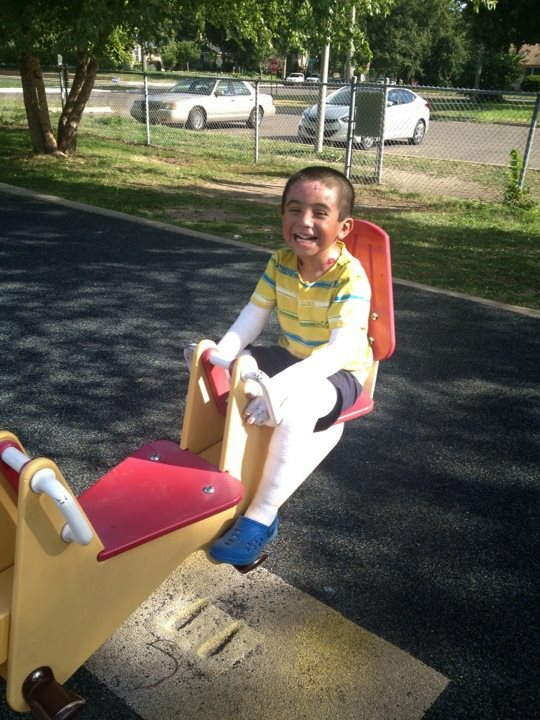 What good or bad experiences have you had because of your child's condition? The hardest experience was at a McDonald's play land. The other children called him a monster and ran away from him. He sat down crying and said, "I am a monster". Needless to say we have a wonderful counselor that has helped him navigate many physical and emotional painful experiences. We are super blessed to have a team of doctors and professionals at the Mayo clinic that dedicate themselves to caring for him and they do a wonderful job. So blessed to have a team. Bad experiences would be the times he is in severe pain and I can't relieve it immediately. Balancing medical needs and the fun an 8 year old boy should be having and protection versus his sense of adventure. Time spent on medical cares, school and fun. His medical needs take a lot of time and after school (we home school) there is not a lot of time left in the day. What has been easier to handle than you anticipated? When we adopted him our focus was on his medical needs as we were on a huge learning curve. With EB we are always learning but we are better educated and caring for him has become like second nature. I hope he feels like our focus is about his life experiences first and his medical needs second. I still struggle at times and say, "be careful" or, "I'm not sure you should do that". Ultimately we let him make the decisions as he knows his limitations best. Protecting him from the hurt others cause through insensitive comments. There have been times he has avoided social contact because of the comments that have been made. I want to protect him from the hurt, and I can't. Instead I encourage and teach him to adapt. 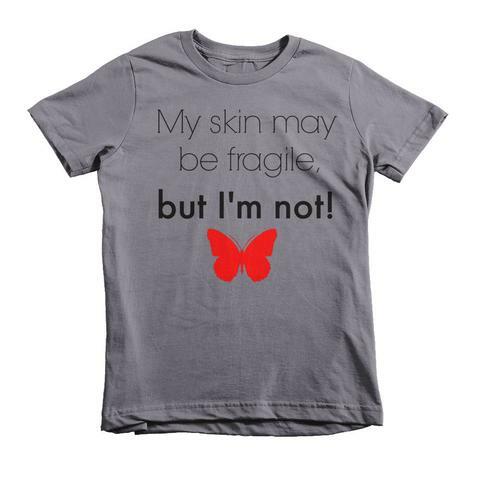 EB is often called the "Butterfly Disease" because of how fragile it makes the skin. 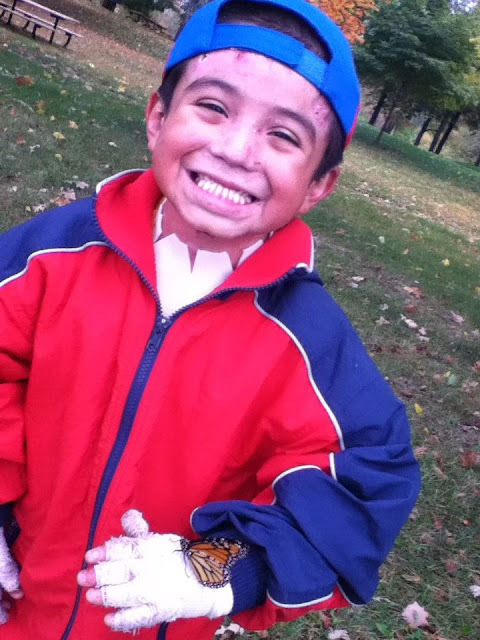 Here, AJ poses with a buttefly that landed on his hand. We have a strong group of family members that help care for his physical needs and encourage him to reach his highest potential. Our medical community really is a team, and our online social community of EB families are always there to teach and encourage. I look to those mamas with kids with EB that are older than my son. My greatest strength comes from God. My hope and joy and pain is all part of my Christian faith journey. What would you say to a parent whose child has just received the same diagnosis? What advice would you give them? My son summed it up best. "Trust God and be brave". It is possible to live with joy even in the most difficult times. One piece of advice from another parent to me was that I would do things that would accidentally and purposely cause him pain; especially during medical procedures. They said to acknowledge it and move on. It's part of the reality of EB. The blessing of being his Mom far exceeds any of the hard times. He is wonderful and amazing, and I am so proud of him. We don't often share our needs with the general community but we are in need of an accessible vehicle that will transport two children in their wheelchairs. 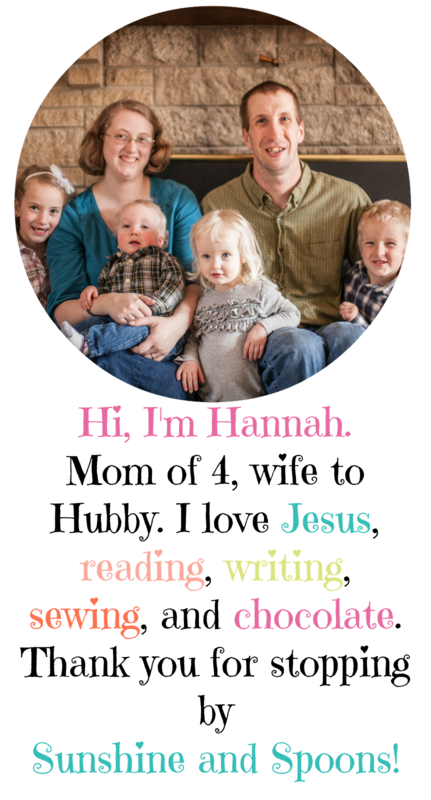 Soon a fund raising project will begin, and we would appreciate any and all donations (Hannah's note: I'll share a link to the fundraiser on Facebook when it goes live). 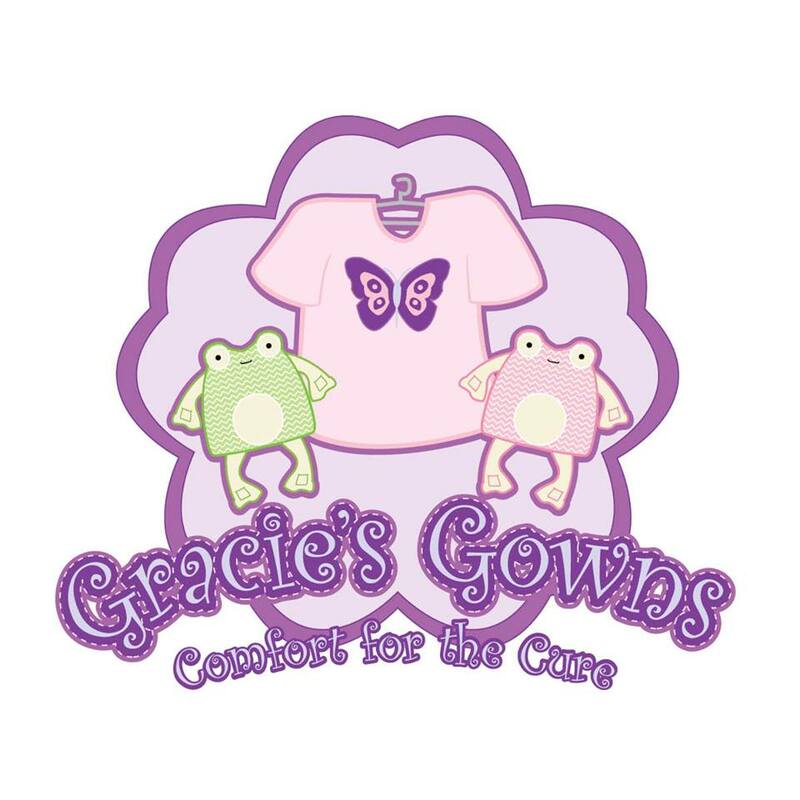 All gifts will be tax deductible and will allow us the gift of mobility. 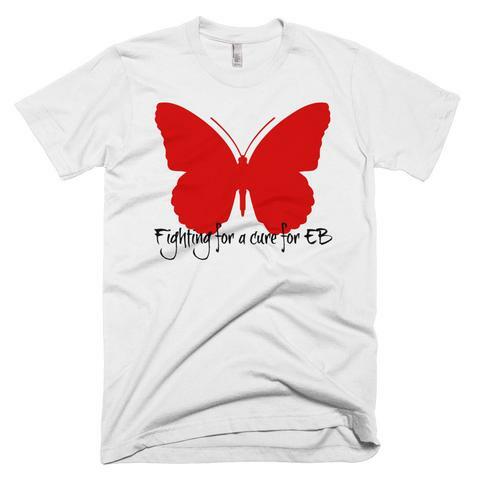 In honor of Epidermolysis Bullosa month, I designed two new shirts for the Sunshine and Spoons Shop. They can be purchased here in different colors and sizes.